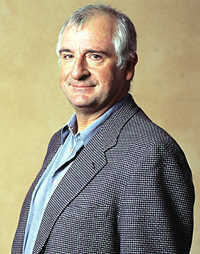 Douglas Adams is best known as the creator of the Hitchhikers Guide to the Galaxy, the story of Earthman Arthur Dent who survives the destruction of his home planet (demolished to make way for an interstellar bypass) by hitching a lift on a passing starship. Originally a BBC radio show, HHGG went on to sell 14 million copies upon its publication in book form -- priming the pump for the bestselling follow-ups that included the novels The Restaurant At The End Of The Universe, Life, The Universe And Everything, So Long, And Thanks For All The Fish, and Mostly Harmless. It also triggered a computer game, a comic book, stage adaptations, a BBC television series, and of course a bath towel, and a film adaptation. Born in 1952, Adams attended Brentwood School and St John's College, Cambridge. At Cambridge he worked with friend Griff Rhys Jones in the Cambridge University Footlights Dramatic Club. In 1974, Adams graduated from Cambridge with a B.A. in English Literature, later receiving the M.A. degree as well. After graduation he worked as a radio and television writer, in addition to writing, directing, and performing stage revues in London and Cambridge, and at the Edinburgh Fringe. In his role as script writer he worked with Monty Python's Graham Chapman, and in fact garnered a writing credit in one episode of Monty Python's Flying Circus (#45: "Party Political Broadcast on Behalf of the Liberal Party"). He also contributed eight episodes to the Doctor Who series (four of them under the pseudonym David Agnew). Together with John Lloyd Adams wrote scripts for two episodes of Doctor Snuggles ("Dr Snuggles and the Nervous River"). The Guide's first manifestation was in 1978 when it debuted as a 12 part miniseries on BBC Radio 4 in the UK. A year later it appeared in print (sporting the comforting phrase "DON'T PANIC" on its cover), and in 1981 it was made into a 6 part BBC television series. Filled with useful tips about how to travel the universe with aplomb, the Guide followed the travails of anti-hero Arthur Dent who tags along with Betelgeusian travel writer Ford Prefect, Galactic President and space pirate Zaphod Beeblebrox, and Marvin the Paranoid Android. Ford and Arthur's adventures -- and the promise of an answer to the meaning of life -- led to four installments of an ill-named "trilogy" and the eventual answer of "42". In addition to the HHGG books, Adams (who allegedly found it so hard to get his books done, that his editor had to lock him up in a hotel room with a typewriter) also managed to turn out Dirk Gently's Holistic Detective Agency, The Long Dark Teatime of the Soul and an alternative dictionary of nonsense words and place names entitled The Meaning of Liff. Later projects included involvement in the creation of computer games such as Bureaucracy (based on HHGG) and Starship Titanic. The accompanying book for the latter, Douglas Adams's Starship Titanic, was actually written by Terry Jones as Adams was reportedly too busy working on the actual game to tackle the book. Notably in 1999 Adams initiated the H2G2 collaborative writing project, an online collaborative encyclopedia that was a forerunner of Wikipedia. But his final project, and longtime labor of love, was the screenplay for a Hollywood movie version of Hitchhiker's Guide to the Galaxy, but unfortunately Adams died before the movie found its ultimate production team. A staunch defender of endangered wildlife, Adams was a patron of the Dian Fossey Gorilla Fund and Save the Rhino International. Adams once scaled Kilimanjaro in a rhino suit to raise money to fight the trade in rhino horn.